Created under the auspices of the Foundation Grésigny, the award aims to promote a singular expression favoured by the use of the large format camera, true homage to composition and time. Created in 2012, the Camera Clara Photo Prize is intended for artists working with view cameras. It awards a previously unpublished work of authorship; presented in a series or photographic ensemble allowing it to be judged for the coherence of both it’s form and content. At a time when a flood of images is available to everyone via the internet and represents an indisputable wealth of communication and sharing, it is also unquestionable – that besides a democratic exchange of valuable content – it has developed a very fashionable “anything goes” attitude in photography, that has created confusion between medium, performance and artistic qualification. For the creator of this prize, Joséphine de Bodinat Moreno and the artistic director, Audrey Bazin, it appeared essential to position oneself at the “reverse angle” or rather “off-camera” of trends and to praise a reflective approach and a certain slowness. In fact by the very process of handling the view camera, its specific constraints, the artist chooses to take his or her time to collaborate with light. In this way we return to the very origins of photography. That does not mean seeing in the use of the view camera, an ode to the past or a method producing a nostalgic tonality, the submissions received prove it each year, work using the view camera is truly an exploration of the writing of light with multiple options. Beyond the attributes of exposure time, control of perspective or focus, the artists have in common this exclusive relationship with the practice and use it to invent particular expressions. The winner will be awarded the sum of six thousand euros. Furthermore, an exhibition may be organised with the work of the winner and any finalists. 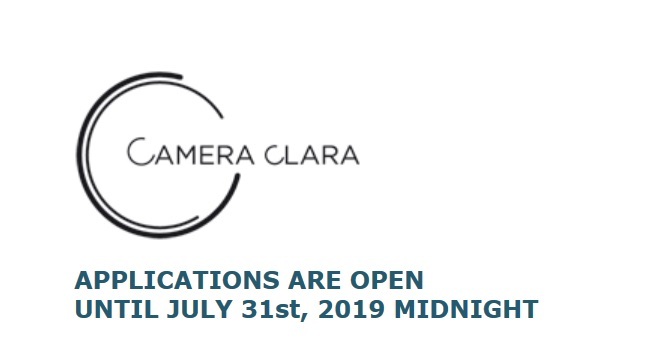 The prizewinner and any finalists must obtain, when appropriate, the authorisation of their gallery or any other representative to exhibit within the gallery hosting the Camera Clara Award show. The terms and conditions of exhibiting will be defined by the venue. The winner accepts to make a donation of one selected photograph to the founder of the Camera Clara Prize. The Camera Clara Photo Contest awards the work of a living, physical person, citizen of the European Union, who has reached the age of majority with no other age distinction. The organiser of the Camera Clara Photo Constest is not permitted to use in any manner, the photographs of candidates who are not finalists. Candidates must warrant to the organiser that their artwork does not infringe third party rights (image rights, private property rights), or that they have obtained from these individuals the necessary authorizations for reproduction and exhibition of the images. To this effect, the candidate must sign and return as stipulated in article 2 of the present Rules the document “Third party rights” available for download on the Contest website.